I have always been intrigued by fashion since I was a young child. I started making my own clothes in secondary school out of whatever fabric I could get my hands on (including most of my parents bed sheets and curtains) until I could afford to buy fabric from the store. People in my high school really took to the clothes I was making and I started selling one offs at local shops in my hometown. I started as a self taught designer and then moved to Vancouver where I attended the fashion design program at Blanche Macdonald Center. Refining my sewing skills and gaining much needed pattern drafting knowledge. Shortly after graduating in I launched my namesake line 'Sarah Runnalls Collection' and showed F/W2010 on the runway at Vancouver Fashion Week. I would classify my work for the most part as contemporary minimalism but I also often lean toward the avant garde. As of late I have been really interested in deconstructivism which is evident in my two most recent collections. I make every piece by hand in my Vancouver Island studio so I am very much a small-run independent brand. My customers are people who enjoy expressing themselves through their sense of style and are proud to stand out and show who they are/how they feel through their dressing. What comes easiest to me is designing, coming up with ideas and executing collections. I squirrel myself away for long stretches of time and create a body of work that I am happy and fulfilled by. The hardest part for me is the business end of fashion. The marketing, branding, social media and website upkeep. All the daunting yet necessary technical maintenance you need to be visible to the public, especially as an independent brand. I find inspiration everywhere. (That's a boring answer I know) but there is so much beauty everywhere, especially where I live in the Pacific Northwest. Whether its art, architectural scapes or nature, we really have it all here. Colour is a very important aspect when I am designing a collection. My latest collection 'Emotions' that I just showed at VFW was technically a fall winter collection but because of the transition into Spring here in BC when I was making it, I was inspired to use a bright and visually exciting colour palette. My last collection however, was entirely black and white. Using stark contrast and textural detail and no colour at all. So I guess it just depends on how I am feeling when I start designing a collection. 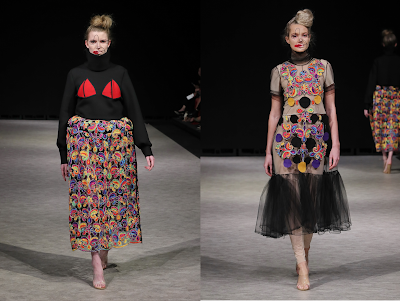 Readers would love to know more about the current collection you showed at Vancouver Fashion Week. Can you describe it for us - aesthetic, fabrics, palette, silhouettes, inspiration, etc.? Do you have a favourite look? My most recent collection was one of the most fun I've done. The palette was very primary; bright pink, blue, yellow and red and held together by a beige knit that ran throughout the collection. (And of course black and white polka dots made an appearance because I love them so much.) Many of the pieces had faces and hands portraying different emotions which were made from yarn and wool and appliqued to the surfaces of the garments. The base materials used to make the collection were linen, cotton, tulle (for the sheer pieces), silk organza and polyester mesh knit. The inspiration was largely based on human emotions. I wanted to consolidate my clothing design with my abstract painting style and what I came up with was really illustrative in nature and different from my usual aesthetic. My favourite look is the knee length, sheer, collared button up with a sad face crying tears on the front holding up blue hands. Under it was a very wearable red knit two piece tank and skirt. I understand you won an award. Can you share about what it was and how it will help you as a designer? I did win an award! It was given a to me by the lovely Sue Randhawa of 'The Optical Boutique'. 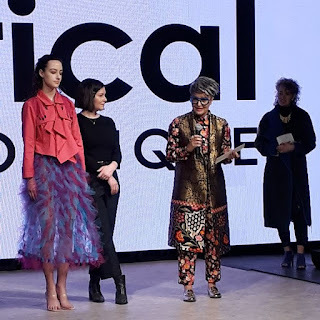 Sue created the award last year to encourage emerging designers that she believes in to continue to pursue their passions and careers in design. I am very grateful and honoured to be this years recipient of the $1000 award and will use it recoup some of the cost that it takes to put a collection together and get it on the runway next season. and the need for financial help." designer is capable of - I want to see a mix of imagination and experimentation. I want to see something different in terms of pattern making and constructing. that are so out of the box that it makes no sense to me." Readers can purchase my line through my website and view my work on my social media outlets, instagram and facebook. I am currently set to show two more collections at VFW. The next one will be this coming fall and another in the spring of 2020. As for my future plans, I would love to show a collection in another city. Tokyo or New York are at the top of my list. It would be an amazing experience and help gain a wider audience. My advice to designers just starting on their journey would be to stay true to who you are as a designer. The more authentic your art is, the more people are drawn to it and feel connected to it. Its definitely not a linear process to "success" so knowing what success/fulfillment means to you as an artist is very important. From firsthand experience I would say that the rewards are not often monetary. Especially in the beginning. It's a lot of money going out and not a lot coming in so balancing that can be difficult. Lastly, you wont always appeal to everyone who encounters your work, so don't be discouraged and always keep working hard, eventually it will pay off. Any day now! Really enjoyed learning about @sarahrunnallscollection and her award from @SueRandhawa. I am so glad. Thanks for commenting.